When Lana Del Rey declared that she ‘climbed up the H of the Hollywood sign’, she wasn’t kidding. Since her rebirth as Lana – after she ditched her Lizzie Grant roots – the songstress has been obsessed with California and Hollywood. So it’s no surprise that the obsession quickly spilled over into her outfits too. Take her breakout persona: a forceful femme fatale siren, with rose-crowned wild red hair, satin-slips, and pouty red lips. In short – the dark vision of allure and Americana. But her romanticism has been continually re-fashioned, blossoming from throwback-belle to ruler of retromania. 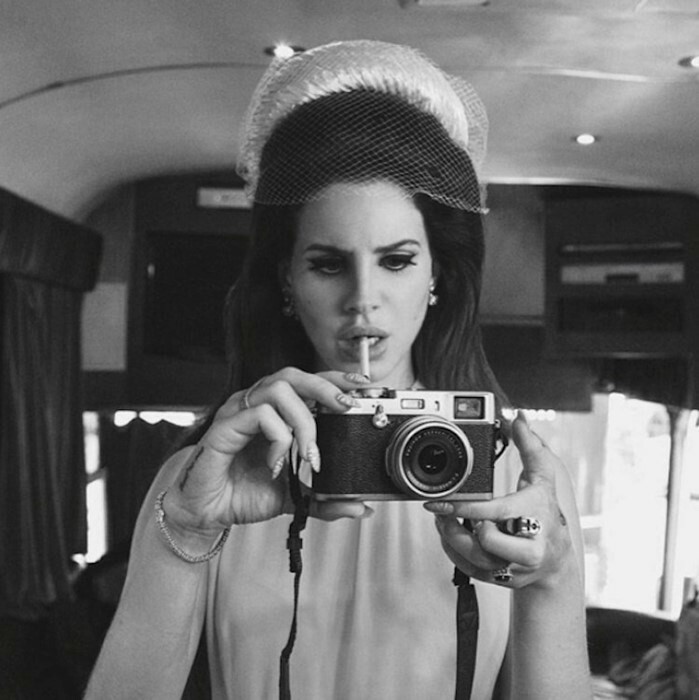 Leather jackets, blue jeans and white shirts defined her age of Ultraviolence: a sad-girl with an ethereal style covered the heated hits of Honeymoon, while white lace and daisies breathed fresh summer air into Lust for Life. Her overarching image? An East-Coast born but West-Coast at heart woman with an effortlessness that matches her melancholic music. Six years on and five studio albums later, Rey continues to flourish through fashion. There are no dull episode in her sartorial saga – from dark heroine capes to floral 60s frocks – and magnetism always pervades. The 2018 series? Her regal charm blossoms even more, thanks to her (heart eyes) friendship with Alessandro Michele, who has cast her the role of a Gucci Goddess. As the singer turns 33 today, we look back at her myriad style incarnations and chart how she became the fashioned Queen of Hollywood. Back in the Born to Die days, LDR’s star status began with her stylised odes to nationalism. Watch her “National Anthem” video, and you’ll see her emerge in a homage to Jackie Kennedy. Babydoll dresses and bouffant hair – the queen of Hollywood was born. And with it, old glamour reigned on. VERDICT: He said to be cool, but she’s already coolest. Continuing with her modern femme fatale status, Rey served on the front row of the Versace AW13 show in a look designed to break hearts: all in black, in a tux blazer with lace detailing in just right places. Daringly chic? Definitely – but she didn’t stop there, topping off the look with knee high leather boots and a signature red lip. We all know that LDR is the ultimate singer of seduction – longing and lovestruck lyrics govern her songs. It’s all video games really, but that’s never stopped her from playing. And from the frontline of fashion, it looks like she’s won. The oh-so-Lana style was set when she stole her beau’s basics: leather motorcycle jackets, white tees, and blue jeans throw endless shades of cool. VERDICT: This is how you do it down on the West Coast. When LDR’s “Young and Beautiful” was released as part of the soundtrack to The Great Gatsby in 2016, crowds applauded and Oscar nominations were announced. She attended the viewing party in a pleated, pink Vivienne Westwood gown, elegant and charming, all at the same time. Lust for Life? Lana’s latest EP is all about times of turbulence, but her glamour lives on and on. Proof? Her glitzy Dazed feature last year, honouring her crystal status through silk and shimmer. Dressed to divinity? 100% – Marques’ Almeida, Prada, Gucci, Balenciaga and Saint Laurent were all seen on the star. VERDICT: Magic babe, isn’t life wonderful? Call the cosmic gods – Lana’s revolution is in full swing. For this year’s Grammy Awards, she opted to channel Hedy Lamarr in a custom silk Gucci gown. Shook? Yes – we’re seeing constellations everywhere, stars in our eyes, literally. But then, when you’re the reigning Queen of Hollywood, why not top it off with a crown. VERDICT: A starry headpiece says just one thing: heaven’s in our eyes. Fit for a ball? Take a tip from Lana, who perfectly embodied this year's ‘Heavenly Bodies’ theme at the Met Ball. Renaissance reigned as she stood poised like a painting, with a casual set of daggers atop her heart. With Alessandro Michele on one arm and Jared Leto on the other, there’s only one thing missing: a throne. She’s probably resting on it as we speak. For now, we’ll have to impatiently wait for her next public appearance (and hope that it includes a baby dragon). VERDICT: The Hollywood heroine – beauty queen style. As our favourite sad-girl-bad-girl, Lana’s tailored romanticism looks set to rule for the foreseeable future – she’s well and truly here to stay. We'll race you to the the champagne – birthday celebrations are calling.